Master key systems are ideal for businesses requiring multi-level security access. One of the core values and most important attributes of Albany Lock Service is our ability to supply and install high quality Master Key Systems for its clients. The client has a Master key that works all locks. Next there is a managers key that operates all locks except the director’s office. A staff key only opens the front door and the lunch room and finally the cleaners key opens everything but the Records Store. A master key system can be as simple or complex as required. If you need a key system for business, residential, guest accommodation or large commercial applications. Talk to our friendly staff who are happy to assist with the design and structure of your new key system, to ensure the end product fulfills your needs. In the early 1980s, Master Locksmith Brian Preddey developed BILOCK, a high security U-shaped key which provided a high level of security and resistance to picking and key duplication. There has been many alterations and upgrades since then but in essence the product remains the same, right up to their new product BiLock Exclusive, which is patented until 2034. BiLock’s unique twin blade keys offer the end user over 16 Million possible key combinations with over 8000 different head colour options. EVVA DPS is a High Security European designed key sytem without the price tag. 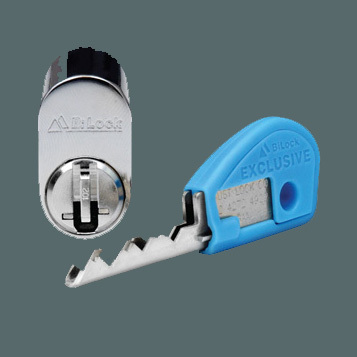 Keys can only be cut using specialist equipment and unique lock components provide a high level of security, reliability and resistance to attack. A system that is secure and convenient with a wide range of applications, the Lockwood Generation Six restricted keying system is an ideal solution to your basic key control needs, providing the perfect balance between security and convenience. Albany Lock Service can provide our customers with their own key management software. Take your Master Key System to a new level of security with Key Manager 7. Key Manager 7 allows you to monitor and manage all keys, key holders and the doors they access. Key Manager 7 may be used as a stand alone application or in conjunction with your lock supplier where data may be imported into the application. From here easily manage records on lock cylinders, keys and assignment of these keys to recipients. Key Manager 7 also allows easy viewing and reporting of any aspect of your key system. Each time a key is issued to a new key holder a receipt is printed for them to sign. A journal is automatically kept for each key, allowing you to recall who had a copy of any key and when. You can link directly to Albany Lock Service using the ProMaster Master Keying 7 system via ProMaster Key Manager. This allows you to receive regular updates and to order additional keys by email.